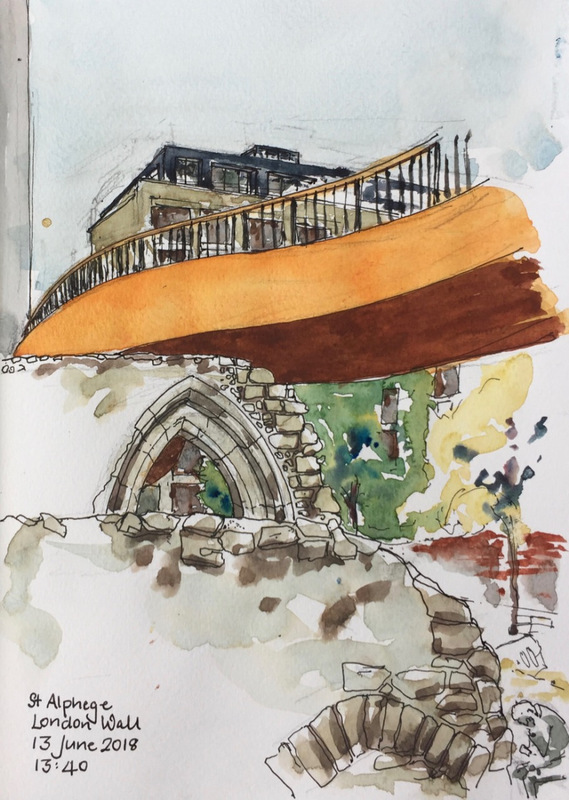 Jane Northcote is an artist, whose latest sketching project is being exhibited at the Barbican Library this February. 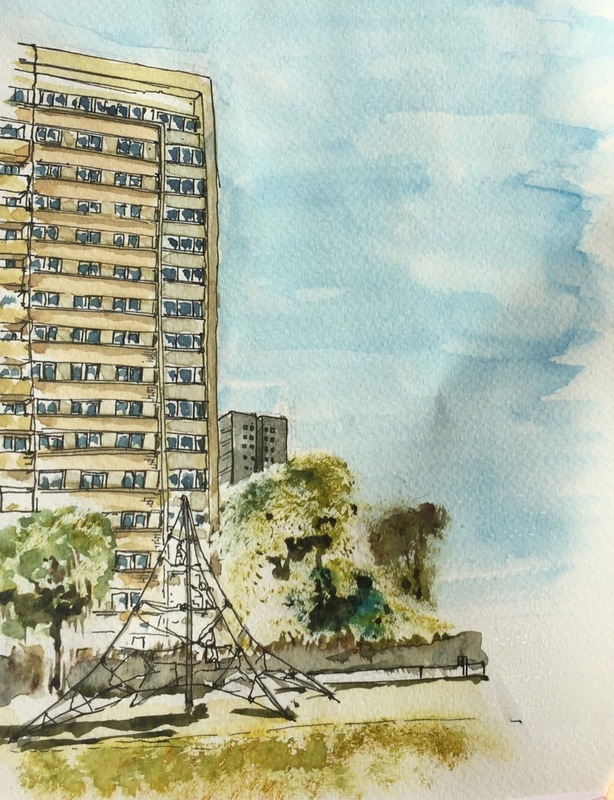 If you’re a fan of urban sketching, pop along to see great plein air ink drawings in the wonderful context of the architecture of the Barbican and central London. When: 1st February 2019 to 27th February 2019, All day every day except Sunday. 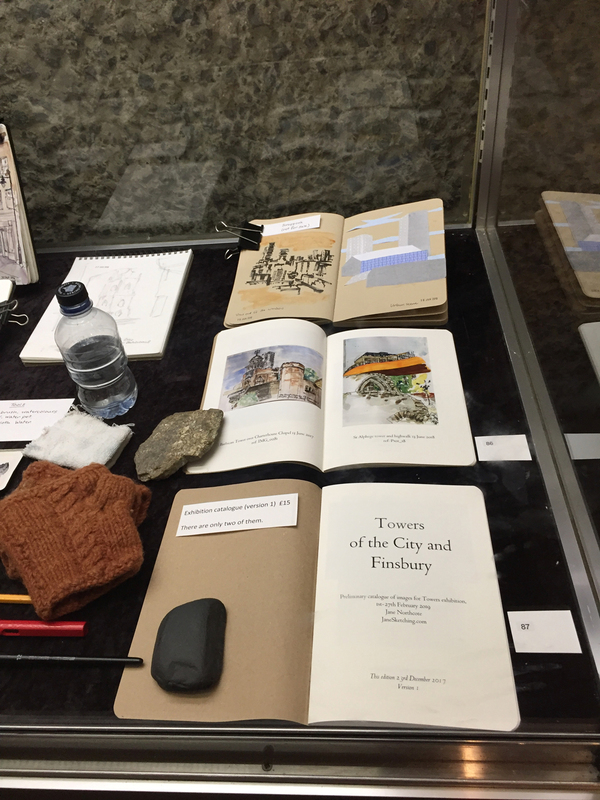 For detailed opening times see the Barbican Library website. Find out more about Jane Northcote’s exhibition on her website. 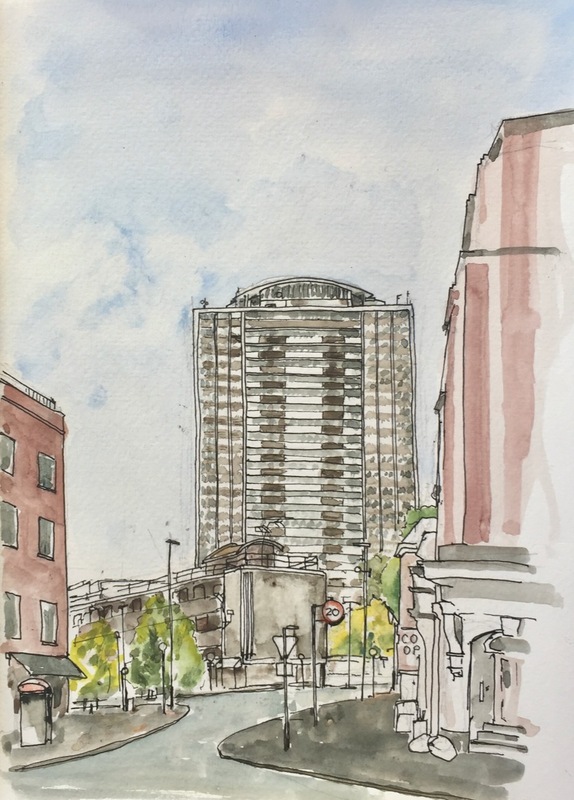 Starting in the Barbican, I set off with my sketchbook to identify nearby towers and tower blocks and discover their stories. 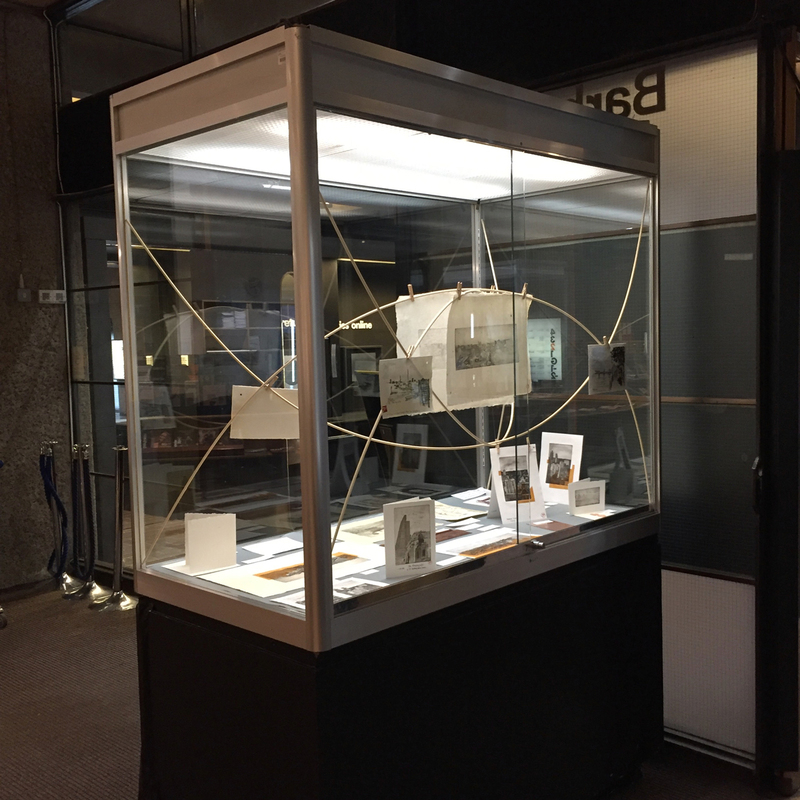 This exhibition shows the results. 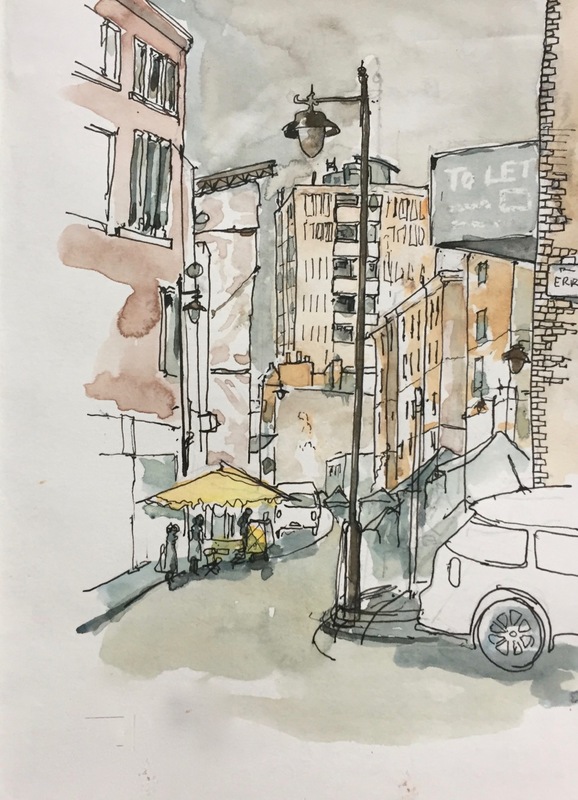 These are urban sketches, pen and wash, showing vistas discovered on walks through the streets and estates of Finsbury, Clerkenwell, and the City. Mostly I draw towers. 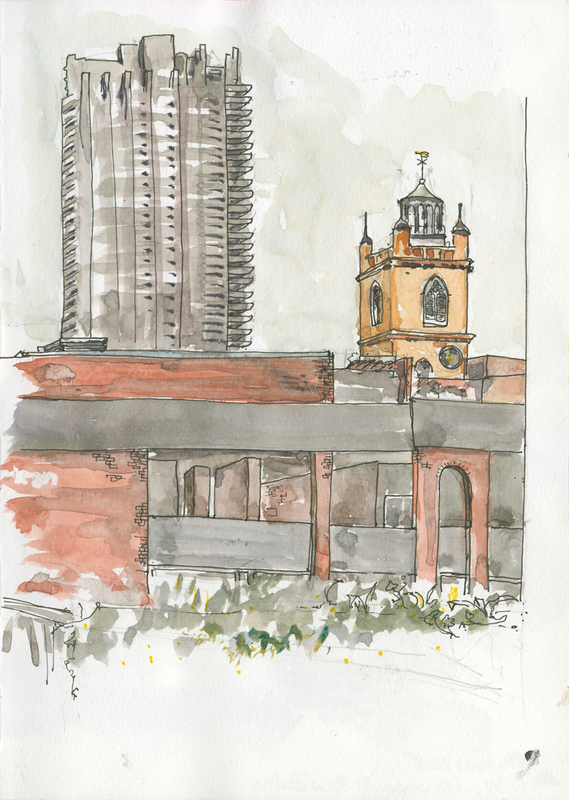 I like to find a vista which shows several periods of history in one view: a Victorian Church, a 1960s tower block, and a 21st-century skyscraper. 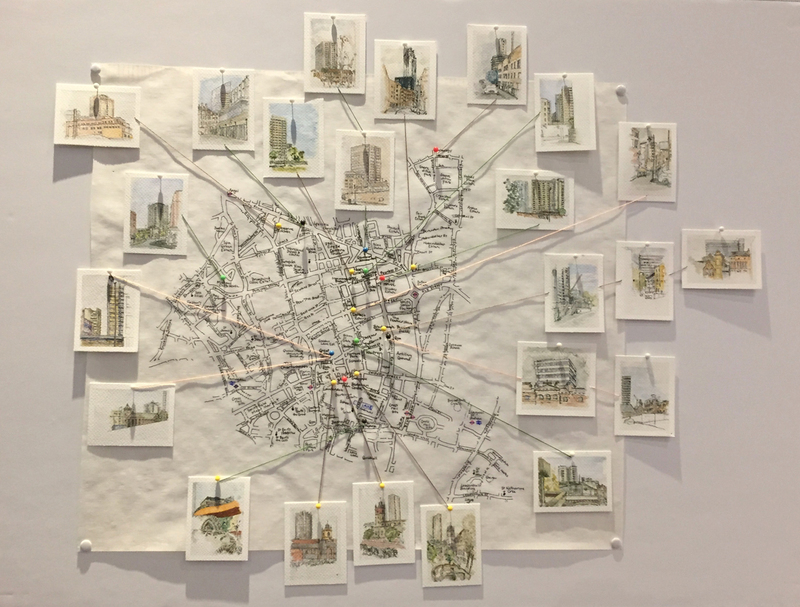 The exhibition includes some of these observations, together with maps of the locations. There are framed pictures, postcards, original watercolours, and etchings. 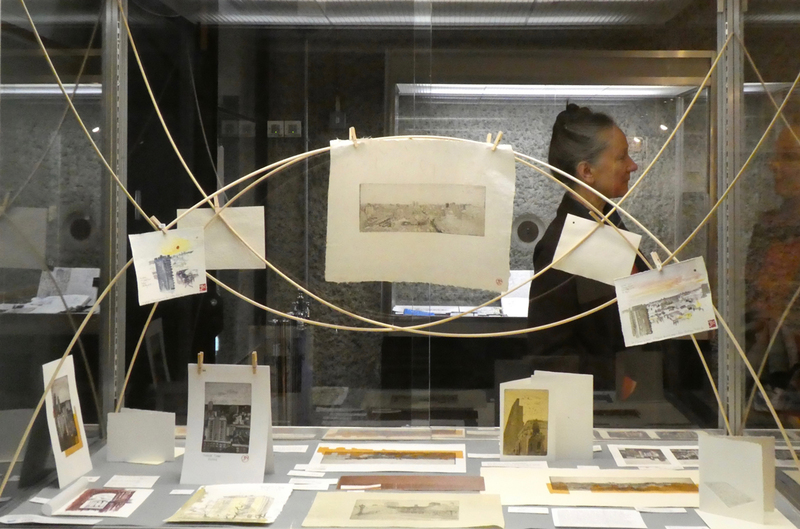 Many of the etchings are presented in the form of greetings cards. All the items are for sale. ‘Coltash Court is the residential tower block in the centre of the picture. It’s 152 Whitecross Street, at the junction of Whitecross Street with Old Street. I can’t see when it was built – looks like 1960s. It’s labelled “Homes for Islington”, with Islington Council branding as well. A one-bedroom flat in there is advertised for £415K, “fully furnished”. ‘1 hr 40 mins from the small park called Radnor Street Gardens. ‘Here is Michael Cliffe House, in the Finsbury Estate, from Tysoe Street. ‘The drawing took two hours. After I finished I went to have a look at Joseph Trotter Close. I saw a low-level set of bungalows, all very much inhabited, with children’s play things and outdoor chairs on the lawn. It may not be sleek, but it looked as though people enjoyed living there. 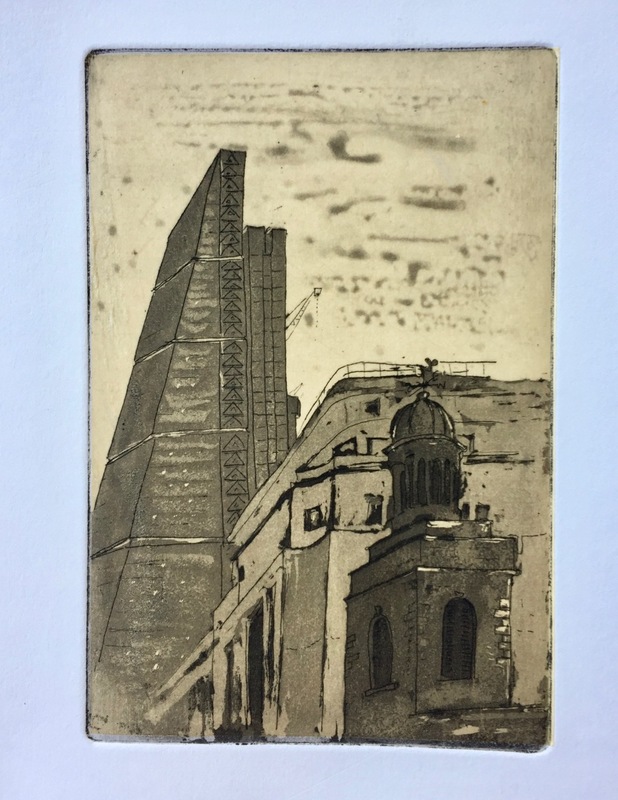 Jane Northcote is an artist based in London, many of her works are of urban architecture in London. 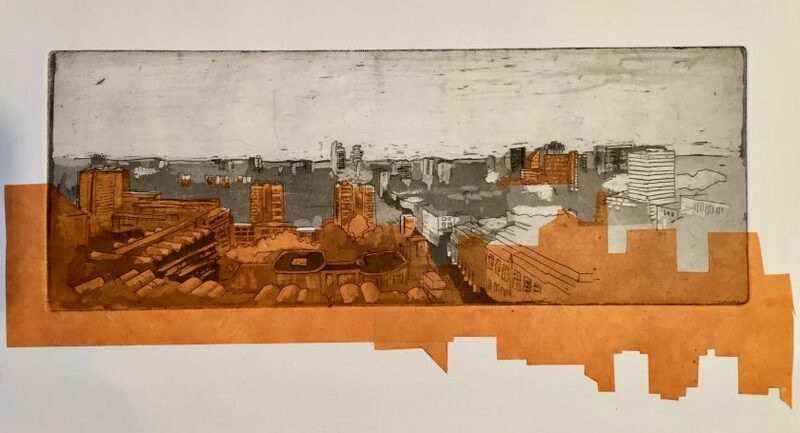 Her drawings are done with pen, ink and watercolour and she also creates prints using etched copper plates, woodcuts and cine collé. 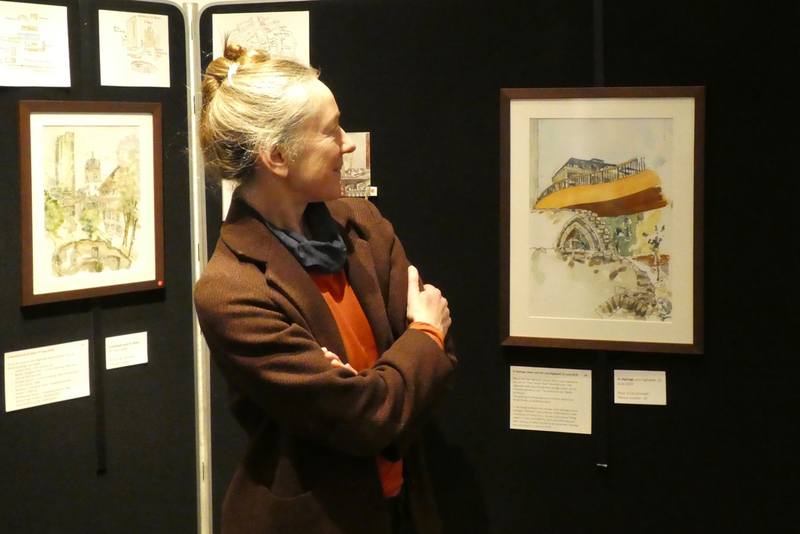 Many of her prints are A5 or smaller and her drawings and watercolours are mainly done in sketchbooks. 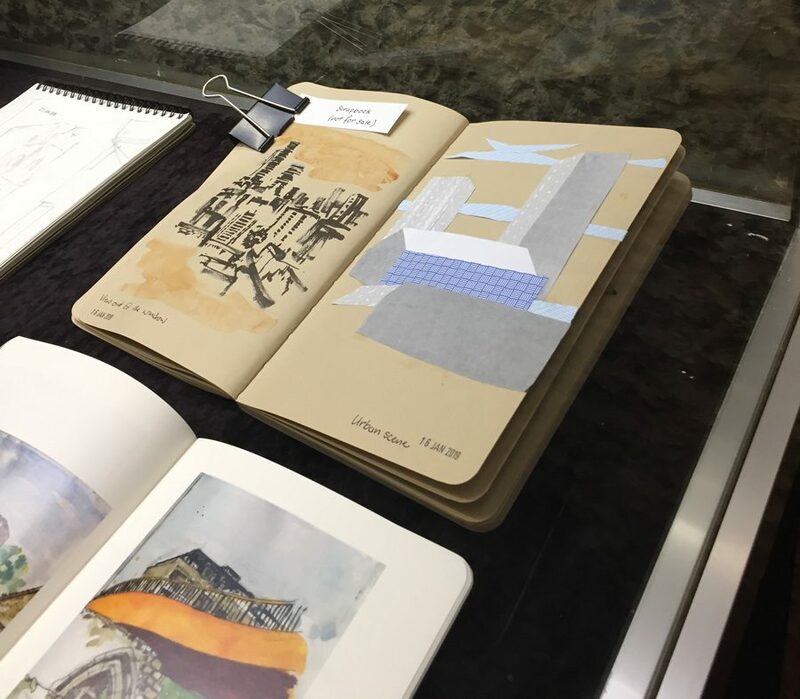 For more information about the exhibition and to read about the Towers Project fully click here.